More than snowflakes are falling! 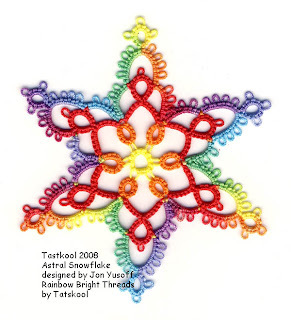 Sherry T made this Denise Munoz Starbright flake. Wow now that really is bright. 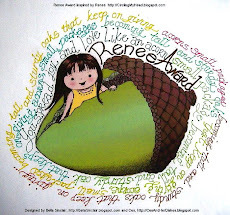 Take a One Sweet Blog Award Sherry, you earned it. Laura has tatted Jon's Milky Way and it is just gorgeous. Light and airy, love the negative spaces. And finally a cross from Christine landed in my inbox. 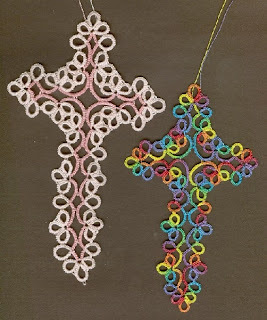 Christine plans to tat a complete series of crosses using the different solid Rainbow colors for the central chains as in the pink cross. They will look stunning. 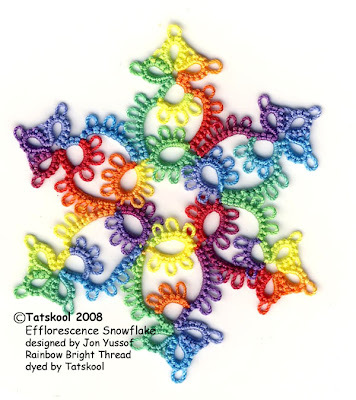 Another crop of Rainbow Snowflakes has fluttered down! I am trying to make all of Jon Yusoff's flakes. Number 3 on my list is Aladdin. 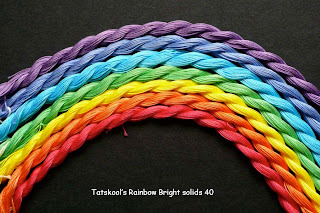 I have been playing with my dyes again and have made all the rainbow colours in lots of different size threads so I can play to my hearts content! 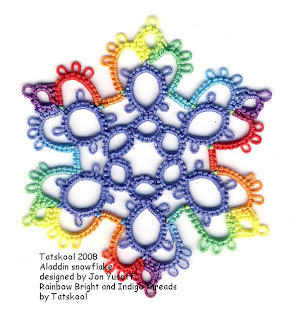 The first colour I chose to play with was indigo and I made Aladdin again. I wasn't sure if i liked at first but it grew on me! I think it looks like a broody indigo sky with a rainbow. Also it shows up the shape of the pattern. Now some friends prefer the original and some the indigo one. So what do you think, It's 50/50 so far. so what do you think????? Doesn't it make the pattern look so different! 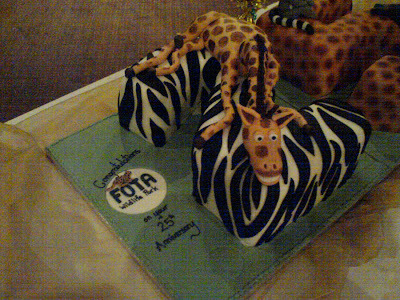 Last night we were guests at the 25th anniversary of our Wildlife Park. but what I want to show you is THE CAKE!! 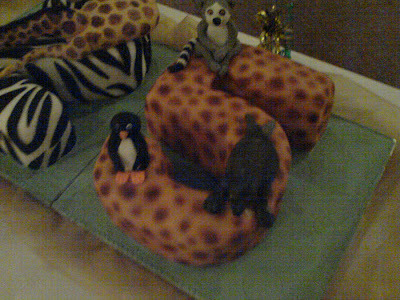 Made by a local lady it was a WOW!! I hadn't taken my camera thinking that there would be nothing to take...so out came the camera phone,2 megapixels is not bad in an emergency but i could have done with a flash. So not great quality but you get the idea. 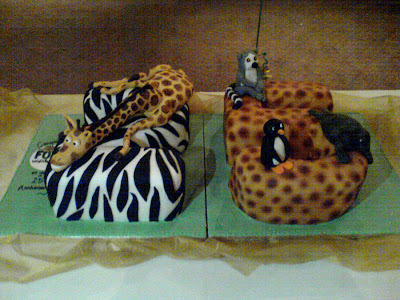 There were two cakes one was a 2 and the other a 5. The cake was yummy too, but I don't know how they could bring themselves to cut it. Back in the fund raising days everyone at the University was asked if they would contribute 10 pence a week to help to fund the park. We still do but now its the huge!!!!!! sum of 50 cents a month...as they say every little helps! .......and I said that I would award it to anyone who showed a real rainbow snowflake on their blog. 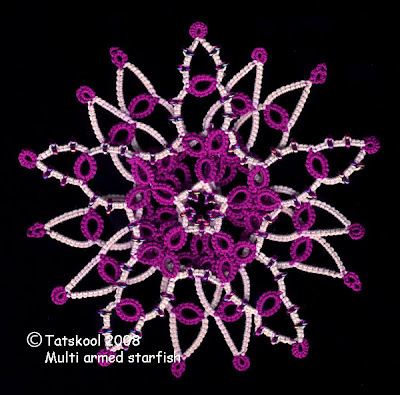 First to show was Snowy with Pirouette from Jon Yusoff's book Tatted Snowflake Collection . The fabulous thing about this..well one of the fabulous things is that the repeat in the thread worked exactly one point of the snowflake.....now before you all get toooo excited I must warn you that Snowy tats in size 80 and so you probably wouldn't get the same effect in a thicker thread...you might get something just as good tho. 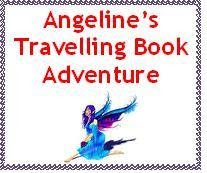 I sent the award over to Snowy but she ducked and it came back to me like a boomerang!! but she deserved it anyway!! Next is Laura who tatted the most gorgeous Snowflake Rose from Denise Munoz's Book of Snowflake Roses. Isn't that just something! I HAVE to get that book. 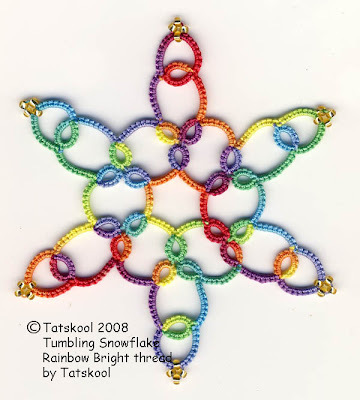 Laura also test tatted my Tumbling Snowflake pattern and made a lovely job of it. Laura definately deserves the one Sweet Blog Award. Incidentely if anyone would like my pattern before I get it on to my website just drop me a line and it's yours. 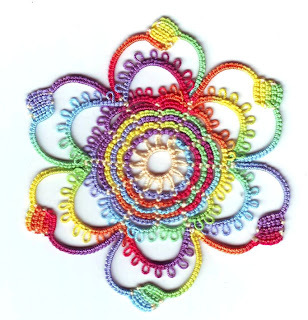 It makes me feel so good to be able to give something back to the tatting community for all the joy it gives me. 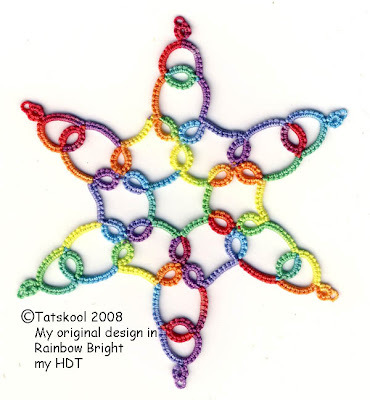 The spiral is from thisntat the star is from Kaye B. Judt's book, Oh My Stars! and if that's not enough to get the award she tatted my Tumbling Snowflake..thanks Steph..take a bow and an award. It looks a little different as there was a bit of shoelace tricking to get the inner chains in Blue Lagoon, as she wanted the rainbow only to be round the outside. Lovely isn't it? 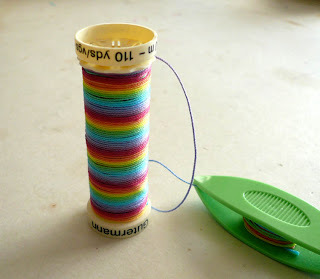 Look at the cool way she winds her thread, she couldn't help it...and she can see at a glance how many yards she has left!! 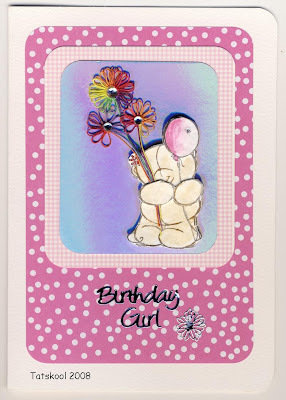 Just have to show you a couple of Birthday cards that I made today. 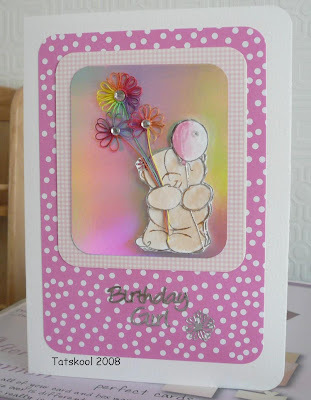 For my BIL..always difficult to make a card for a fella. This was the card on the scanner and this what it looks like in real life. 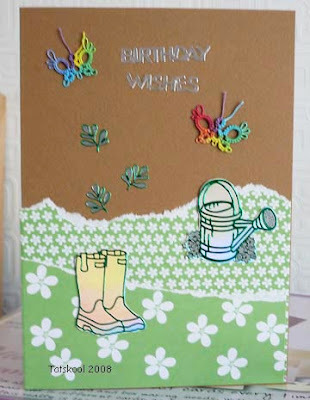 I wanted to show you that the wellingtons and watering can are mounted on holographic card and catch the light in so many different colours depending on the angle. 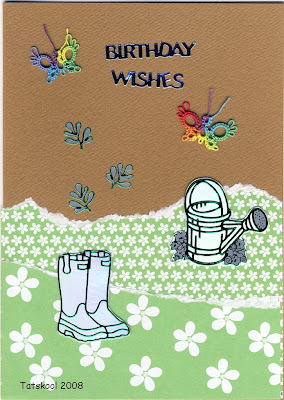 This is for SIL... i just got a new Forever Friends rubber stamp and have been dying (not dyeing)to try it!! This out of the scanner again shows the holographic card. Bet you cant recognise my favorite thread in there, oops I promised my self that I wouldn't mention it today. Hope they will like them. Way back in May I was supervising a really boring exam....boring in that it really couldn't take a lot of walking up and down.During these exams sitting down, it is often hard to stay awake and especially to keep my eyes open. I need something to stimulate my brain into active thought. 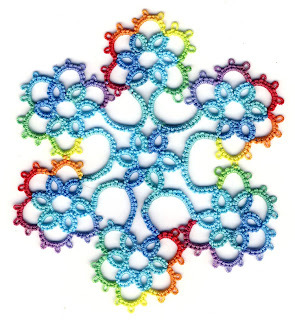 So I was flipping through Elgiva Nichols-Tatting Techniques book, looking I guess for inspiration. I got as far as page 31 with the rings and chains motif that she describes as a Scroll. I was taken by the effect of the inward facing chain and outward facing rings. I started to doodle what it might become. Now anybody who know me knows that I am not original, I find it very hard to design....anything! Maybe I don't try hard enough or maybe it's because there are so many patterns out there that I want to make. 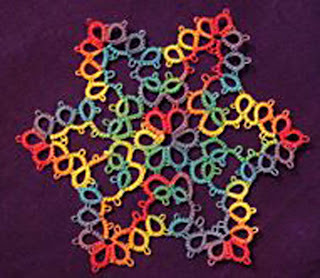 I have only two original patterns to my name and they can be found on my website. Unlike so many of you, my head is not buzzing with designs all trying to get out. But it is full of the desire to make things and to make them to the best of my ability....and it always has been. I got the stitch count right at my first attempt with just a tiny trial in white and then plunged in with Rainbow Bright as I was itching to see what it was going to look like. Oh! I loved it from the very first stitch. 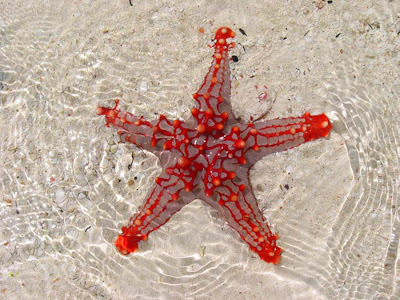 and so my starfish was torn assunder…....well figuratively speaking! one half went to make a new Snowflake and the other a Starfish!! The inward facing curve following the central inward curve, that I really, really liked was replaced by an outward facing curve making it more snowflake than starfish. 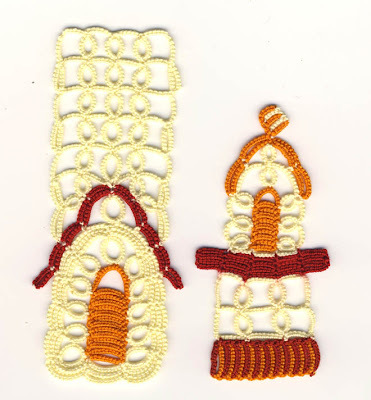 The tips of the arms lost the little ring and gained 4 beads. Oh my!! I LOVE IT!! If you could only see how those gold beads sparkle. I really like the way that it shows off Rainbow Bright.... 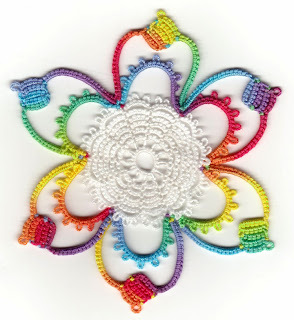 I know that I could have added frilly picots but I like it's simplicity. 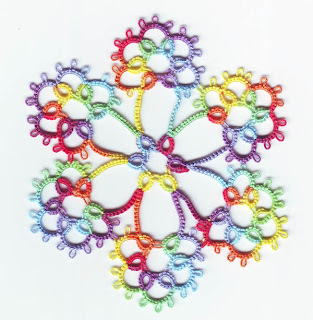 I know that it looks simple, basic and straightforward but I LOVE IT and honestly haven't been able to find a snowflake like it on the net or in my collection of books. 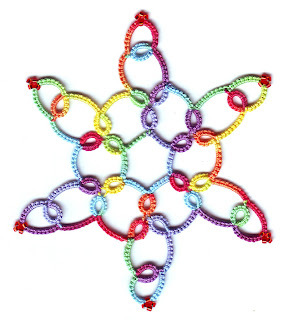 It came totally out of my head after the initial stimulus of the inner circle from Elgiva Nicolls...but I know that doesn't make it mine if someone claims that they have designed it before. Look at it on a black background...... I like the effect of all the circles that the chains make. Well he keeps the inward facing chains because that what makes him a starfish. But he loses an arm…......ouch!! The arms are made more pointy by using the shoelace trick recommended by Jon Yusoff. On black background he is a wow! But what kind of starfish is he…….Linkia suggests hubby ...…we look it up…it’s a beautiful cobalt blue…but its arms are really rather too long in proportion to my central disc. 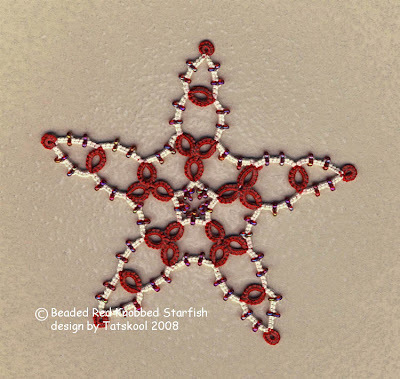 Now I know some people are going to say that it doesn't matter what kind of starfish it is...but I am a Zoologist and to create something that actually looks like a named animal is the cream on the cake to me. 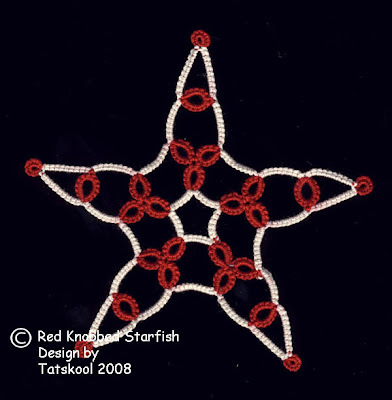 What about Protoreaster linkii The Red Knobbed Starfish………he says....gosh it really looks like this one. I am sorry that I couldn't contact the owner of this photograph so I hope that they won't mind my using it. 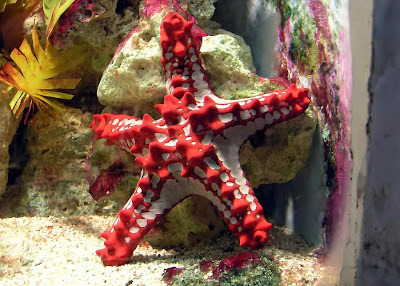 Red-knobbed Starfish Protoreaster linckii at Bristol Zoo Aquarium, Bristol, England. It looks as though I’ve propped this animal at the best photographic angle, in fact it was like this when I approached the tank (to my delight!). Photographed by Adrian Pingstone in December 2005 and released to the public domain. So made it in red and cream then changed the outer ring to a Josephine ring a la method of Jane Eborall and am happy with it. It looks so different when made in 2 colours. 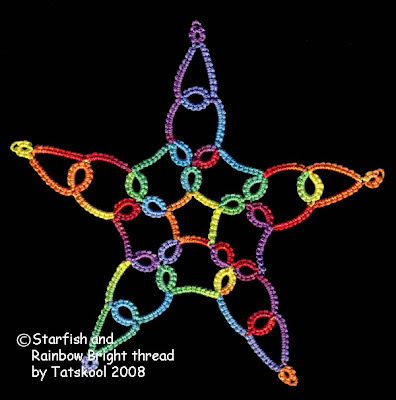 But with beads it is GORGEOUS and so Starfish like...I am amazed! With a little bit of computer jiggery pokery he really looks like he is on sand in a rock pool...well he does to me!! Pile 3 on top of each other, a little computer colour change and I have a multi armed starfish reminiscent of the Crown of Thorns starfish, such a nuisance on so many coral reefs. If nobody claims these pattern as theirs I will post them on on my website as my Christmas present to you all. So far the gurus that I sent the pattern to don't recognise it but that means nothing...if I am stepping on anyones toes, I humbly apologise. TIAS 4 cool or what! Like so many others I have been eagerly following Sherry Pence's TIAS 4. 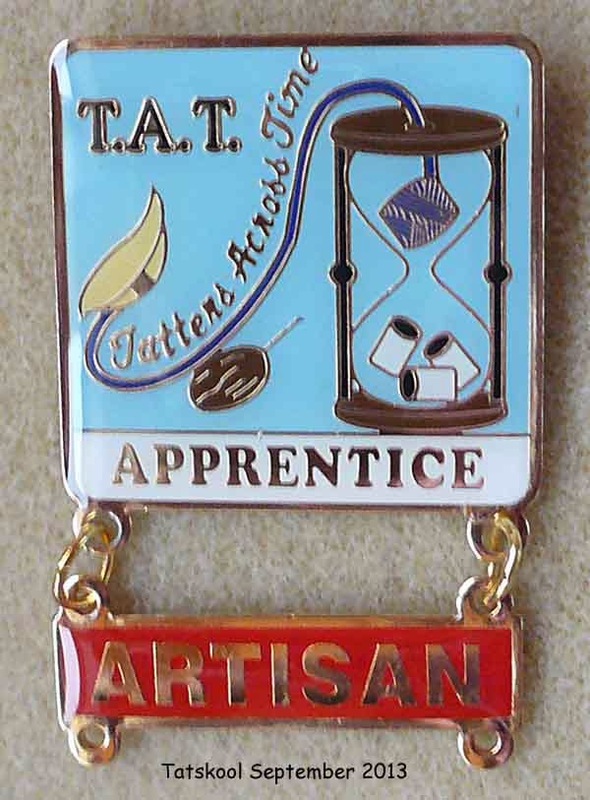 TIAS Tat It And See is a wonderful, wonderful invention by Jane Eborall. The design is posted in little bite size pieces that each in itself is not too challenging, but if it was seen as a whole many tatters would look at it in horror as way too difficult even to attempt. But that's not it's only attraction......it is a BIG TEASE!! Sherry's TIAS was a huge tease right to it's final stages. 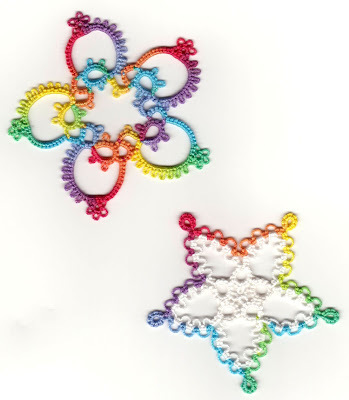 She gave us very strange little bits of block tatting which built up into even stranger bits. I thought that maybe it was going to be a bed, then a little house. I was a little slow to get going on this one and always struggling to catch up. Many many blogs had to go unread for days as I was afraid that they were going to show bits that I hadn't yet got to. When I finally got bitten by the bug of what the heck is this going to be I had to catch up quickly. But it wasn't until I was part way through days 10 and 11, yup at the same time, that I actually took time to lay it out beside me one on top of the other and say to hubby " I haven't the faintest idea what this is going to be....oh my goodness it's a LIGHTHOUSE!!!" all in one breath! Of course we couldn't just let it be A lighthouse we felt that it must be a particular lighthouse as the pitched roof above the lower door was not familiar to us on a lighthouse. Hubby thought he remembered a famous lighthouse that may be like that, then he narrowed his search to New England and before we went to bed that night he had shouted "eureka this is it"...or something along those lines. Oh my isn't the internet wonderful, what did we do before we had it...I suppose go to all those books we have, but they wouldn't have come up with Great Point Light Nantucket. Wikepedia says .........also called Nantucket (Great Point) Light is a lighthouse located on the northernmost point of Nantucket Island. First built in 1784, the original wooden tower was destroyed by fire in 1816. The following year a stone tower was erected which stood until toppled in a storm in March 1984. Rebuilt again in 1986, the stone tower was built to replicate the old one, and still remains in operation today. Modern additions include solar panels to recharge the light's batteries, and a sheet pile foundation and 5-foot thick concrete mat to help withstand erosion. The lighthouse sits on a thin spit of beach where the currents of the Atlantic Ocean and Nantucket Sound meet. I couldn't find a single picture of her from the front. Now isn't she a dead ringer for Great Point Light. I even like the colours that i chose. 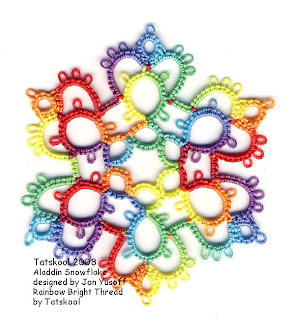 One thing that had puzzled me was the two colour block tatting panel....but doesn't it just have to be the block of solar panels???? 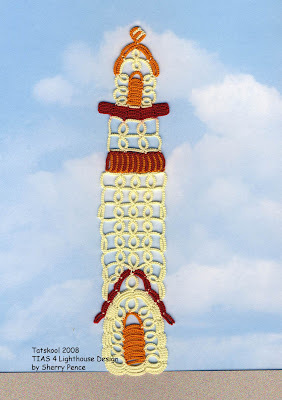 Sherry says that hers is not modelled on any particular lighthouse, and that she lived in Oregan and loves lighthouses. So I had to look up Oregan lighthouses and sure enough there are some with the porch entrance but I don't know about those solar panels! This lighthouse is a work of art, I particularly like the way she has made the brickwork for the body of the lighthouse walls, and the way the entrance has a solid 3D quality to it. I am still sticking to Great Point Light and I am going to treasure it. Thank you so much Sherry. What do you do when your Leprechaun is trying to take over your life??? My Rainbow Bright is constantly disappearing and I am beginning to realise where it is going. Fionn is stashing it away for a rainy day...... very funny Fionn!! Can you see him up there, he already threw out my photo and replaced it with one of himself and now he is showing off my/his thread. 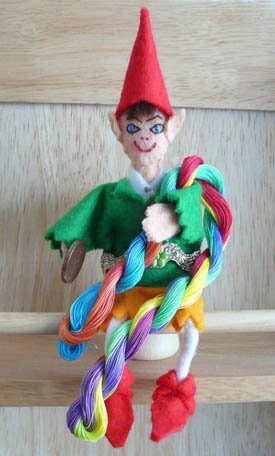 That was the last skein of size 80 and when I asked him politely to give it to me, his answer was just......"Mine, Mine, Mine!" 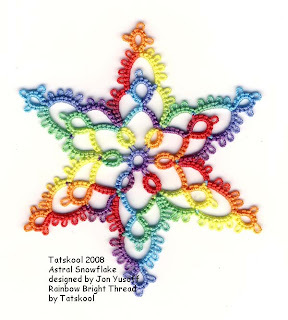 Well I did get it off him by bribing him with letting him hold my latest rainbow Snowflake from Jon's book. 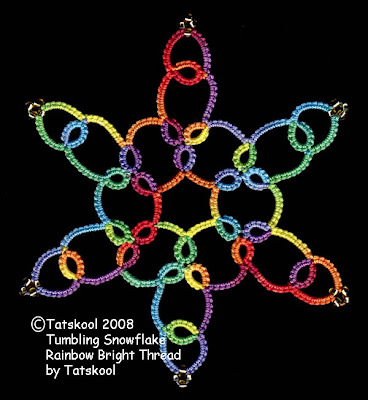 This one is Efflorescence, made in Rainbow Bright 20 it measure 2.25 inches, a little bigger than Twirly. 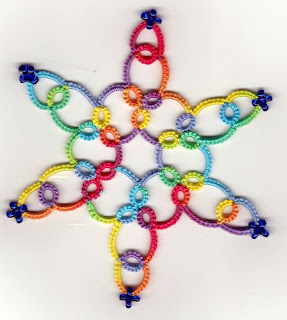 The big news is that i have designed a snowflake especially to show off my thread...it's like me basic, simple and straightforward!! as i am NOT a designer! !...and it's coming soooon!! 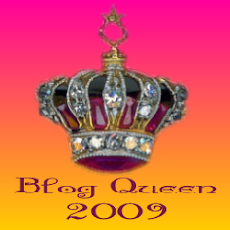 The second big news is that I have been awarded the One Sweet Blog Award by tattingchic...she thinks my blog is sweet!! aw shucks!! It was created by an artist by the name of Diana Evans. To quote the creator of this award, she says, "I have a special award for all the sweet blogs I visit...I am giving this award to all the wonderful people that I visit almost every day....they have inspired me and shared their wonderful lives with all of us....I only ask that you nominate some of the wonderful people you visit each and every day...."
Now I have to award this to other blogs... 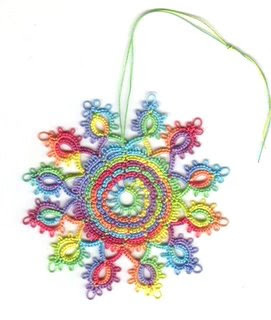 I have done this before and it is so hard to pick from so many great blogs... so I have decided to give the award to everybody who makes a real Rainbow Snowflake and shows it....cool or what!!! These will all be people that I visit each and every day for sure. So take an award Rainbow Snowflakers. She also tagged me but I may have to take a rain check on doing that. Oh! and another cool thing is that I have finally caught up with day 11 of TIAS 4. I have one serious guess and I hope that I am right and I find myself wishing for it to be tomorrow when the final part is launched. The day the Queen came to town to say'Goodbye'! 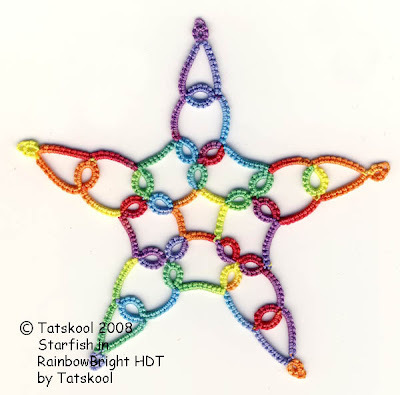 This post has nothing whatsoever to do with tatting!! 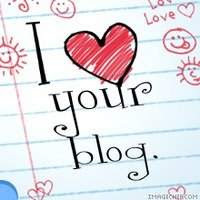 and so for those of you who like the other things that I write, grab a cup of tea and mosey over to my other blog here. Everybody else can go back to what they were doing before they saw this title!! If you enjoy the post, please do leave a comment to reassure me that all my time and effort wasn't wasted.